I am willing to admit: prior to writing this, I had no idea what lip scrub was or what it was used for. After researching this list, though, I am a convert! For those as confused as I was, lip scrubs are designed to keep the area they are applied to soft and supple, and a homemade scrub can give you a variety of options when it comes to flavor, consistency, and purpose. I’ve spent the last week trying each of these out and they are now listed in order of my favorites! I hope you enjoy them as well. Your basic scrub is very simple. There’s no real “flavor” to it, and it’s not overly exciting. However, a simple scrub might be the best place to start if you’ve never DIY’ed your own exfoliating scrubs before. Mix, rub on, let sit for one minute, wipe off, and apply a lip balm. Okay, so this isn’t really the name of a scrub, but it is essentially what this following recipe is. 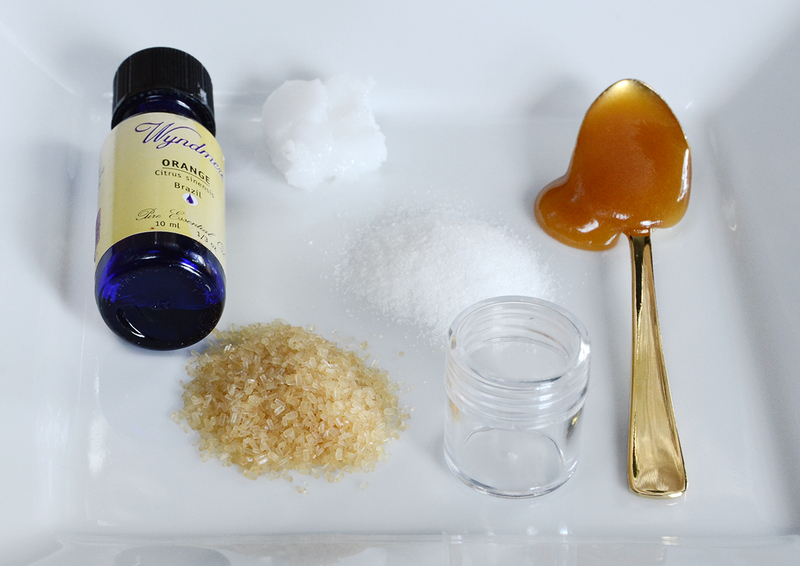 Using your favorite liqueur, you can create your own liqueur flavored scrub. Only let this scrub set on your lips for about ten seconds before wiping off. Use a lip balm after wiping off the scrub and enjoy. If like me, you enjoy your daily coffee, a Vanilla Latte Scrub might be right up your alley. A little bit of sweet, a little bit of caffeine, and a whole lot of exfoliating will go a long way with this scrub! Mix, apply, and let it sit for about 60 to 90 seconds. Apply lip balm when finished and enjoy your day. Honestly, I am not the biggest fan of chocolate in general. But add a little bit of peppermint to it, and it makes a perfect scrub for the holiday season (or a perfect gift, if you prefer). As with all scrubs, rub a bit into your lips, let it set for a minute, then gently wipe off with a damp cloth and apply lip balm. I love a good orange creamsicle, especially in the heat of summer, so this orange creamsicle lip scrub was a dream come true. Mix, rub on, let sit for a minute, wipe off, and apply lip balm. Store in a cool, dry place. Living where I do, coconut and lime are two of the most popular flavors. No matter where you are, though, a coconut lime lip scrub can give you a sense of the tropics even in the dead of winter. As always, mix, rub on, let it set for a minute, then wipe off gently with a damp cloth before applying lip balm. I love lemonade of all sorts, although my favorite has to be raspberry lemonade. So when I stumbled across a raspberry lemonade lip scrub, I was incredibly excited to try it out. I wasn’t disappointed! It is by far my favorite of the scrubs I tried out for this list. I enjoyed each of these scrubs and I hope you do as well! Just remember not to use your scrub more than once or twice a week. You may damage the delicate skin of your lips otherwise. Did you enjoy our list? Do you have a DIY lip scrub recipe you love that we didn’t list here? Let us know in the comments below and don’t forget to share!